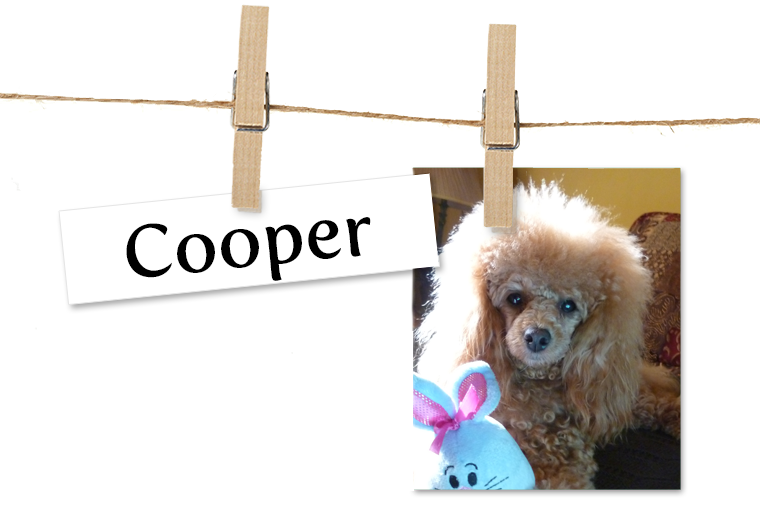 Story What makes Cooper so special to me is that he filled the void in my heart after my precious Maximus passed away over a year ago, the end of February 2014. Maximus was the lucky "Pet of the Week" winner the month of December 2013, he had just turned 13 years old that Christmas. I was so sad after his passing, that I almost did not want another dog in my life, until months later, a friend introduced me to a local breeder who had just one puppy left. Boy, it was love at first sight! Cooper's becoming quite a character, so full of energy and unconditional love. He loves exploring and every day is new adventure. He especially loves to go for long walks, chase lizards and share frozen green beans with his pals. When he's not playing with his friends, you'll find him zipping around his home with his squeaky toys, occasionally stopping to bark at his reflection in the mirror! His nickname is "Noodles" because in the mornings while stretching out, he is all legs, all relaxed and limp as a noodle! While I will always have a special place in my heart for Maximus and he will always be remembered; little Cooper has won me over and so, it begins - a new happy chapter in my life.